"50,000 Apply. 1,200 Are Accepted. Only The Best Survive"
Jake Huard lives with and works for his father who, after his wife died, has been emotionally inaccessible. Jake leads what he considers to be an unfulfilling life working at a naval shipyard; but he is thrown a bone when he learns that he has been accepted to the U.S. Naval Academy in Annapolis, MD. At his going away party, Jake's friends convince him this beautiful young woman named Ali is a prostitute--a going away gift. His life is turned upside down when he learns the next day that not only is Ali not a prostitute, but she is one of his instructors. Now that they're formally introduced, she intends to make Jake's life far more complicated with a series of hazings. When Jake starts to fall behind in his training, he kicks it up to prove that he is worthy of being in the United States Navy. Does he have what it takes? 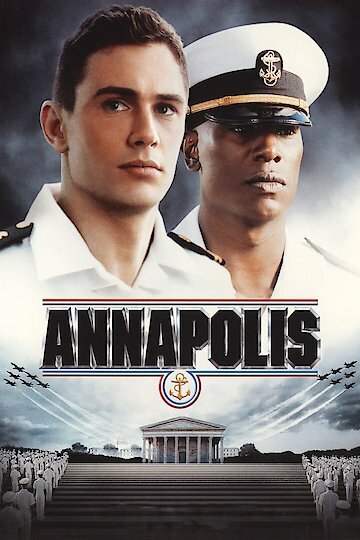 Annapolis is currently available to watch and stream, download, buy on demand at Hulu, HBO NOW, Amazon, Vudu, Google Play, iTunes, YouTube VOD online.